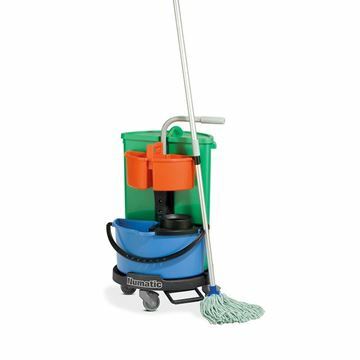 The largest in the Carousel range with 70 litre lidded waste bin, 2 compartment caddy, plus an integral 14 litre mopping bucket. Superbly equipped for any mopping and cleaning task. Bag holding system, central cupboard (access either side), lockable, 2 keys. 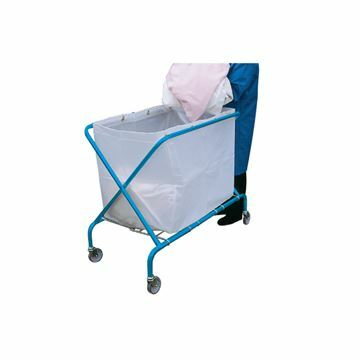 Convenient multi-purpose cleaners trolley, folds away for space-saving storage. Strong tubular steel frame with support tray for heavy-duty work, hard wearing vinyl coated finish. H: 91cm (36") W: 58cm (23") D: 66cm (26"). 75mm (3") swivel castors. Waste bag is fire retardant. 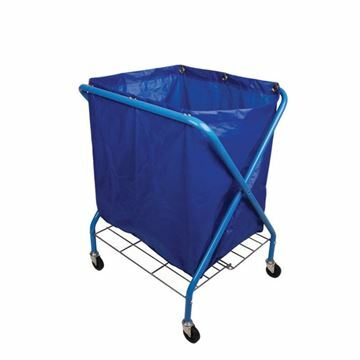 Highly versatile, ideal for moving bulky items in retail stores, laundries, hotels, hospitals and waste management. 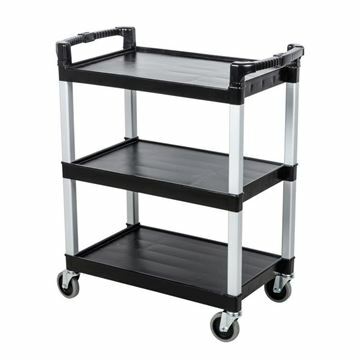 Strong and durable tubular steel frame with tray support, quickly folds away for convenient space-saving storage. 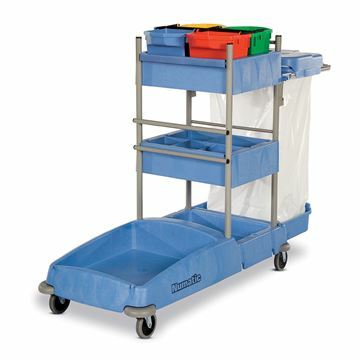 This compact cleaning cart is both space efficient and versatile. Designed to accommodate common cleaning items and waste collection. Ideal for use in confined areas with limited storage space. Complete with bag. 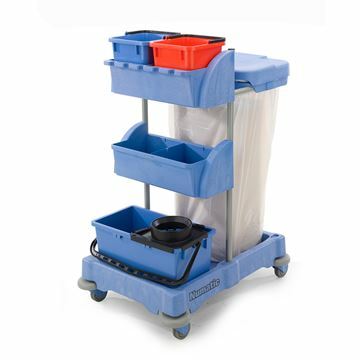 Three shelf cart features a seamless construction for easy cleaning. Use for industrial, food service, and more. 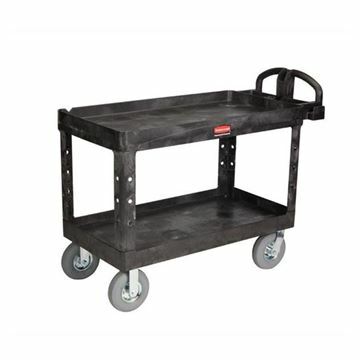 Holds up to 200 pounds and rolls easily on 4" heavy duty, non marking grey casters. The VCN-1804 has been developed from the ground up, giving high priority to exceptional mobility, constructional integrity and usability. Numerous optional facilities can be added to extend the scope of the product to meet different requirements. Big in use, small in storage, the Servo-X trolley range will always find favour in the many locations where space is at an absolute premium. All Servo-X trolleys can be easily folded for storage and the laundry bags themselves can be removed, incorporating drag handles and our top closure system. The complete structure is based on our full Structofoam chassis, 100mm heavy duty castors and rotating corner protectors, a tubular epoxy-coated steel superstructure, deep and generous adjustable tray units, 4 x 5 litre top pails (or 2 x 10 litre pails optional) and universal dual waste system providing a choice of either single 120 litre or twin 70 litre waste disposal. The waste system is easily folded for compact storage. 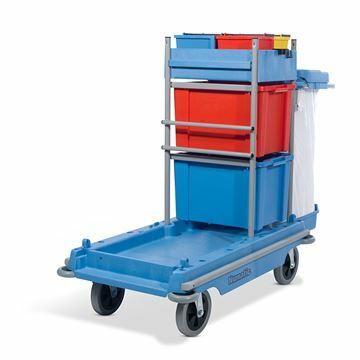 The ideal choice of service trolley where space is at a premium but where the need for limited mopping facilities is essential. The XC-1 is fitted with a full size Universal Dual Waste System to allow a choice of 120 litre (that accepts 700 x 1100mm waste bags) or twin 70-litre waste units (that accepts 575mm/1000mm waste bags), allowing for simple onboard waste separation. 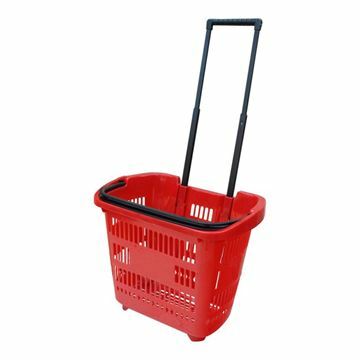 Allow customers to buy more and carry more around your store by using these shopping baskets with wheels.